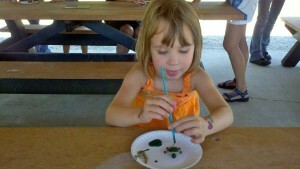 In my never-ending quest to find inexpensive things to do to beat the heat in Hendricks County, Indiana, this summer, the Turtle Time program offered by Hendricks County Parks & Recreation on July 21 piqued my interest. It sounded interesting; it was free to attend; and it was scheduled to be indoors at the McCloud Nature Park Nature Center. Count me in! So my 5-year-old daughter and I ventured out to the North Salem, Indiana, area to check it out. As luck would have it, the break in the heat and humidity that day allowed the staff to hold Turtle Time outdoors in the pavilion, which was actually quite nice. I had nearly forgotten what it was like to be outside. For about 30 minutes, park naturalists Connie and Stephanie taught us about turtles that are found in Indiana as well as facts about turtles in general. We learned that turtles have been around for about 200 million years and that there are about 300 species of turtles worldwide, on every continent except one. We learned about the anatomy of a turtle, whether or not they can come out of their shells, and how they regulate their body temperatures. And that&apos;s just the tip of the shell. Not only did my daughter learn about turtles, I also learned some things, too, including a word I had never heard before: estivation. I also learned the difference between a turtle and a tortoise. Do you know what a group of turtles is called? How about the word for a baby turtle? What are a group of turtle eggs called? What influences whether a turtle will be a boy or a girl? I didn&apos;t know these things before Turtle Time, but I do now! 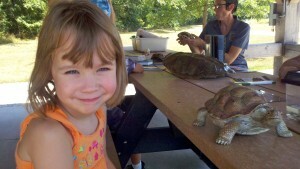 I was surprised to learn that it&apos;s illegal in Indiana to own a turtle that is native to the state. There are some very good reasons why, in addition to running afoul of the law. Connie and Stephanie had plenty of great visual aids, including a variety of turtle shells, a rubber model of a tortoise, a snapping turtle skull, some vacated turtle egg shells, and a real live painted turtle hatchling that park naturalists had recently rescued and are preparing to reintroduce to the wild. Kids and adults alike loved all of it. Connie ended the presentation by answering a bunch of questions and reading a book called "Box Turtle at Long Pond," and then those in attendance enjoyed a turtle craft to wrap up Turtle Time. It was a really enjoyable hour-long program. 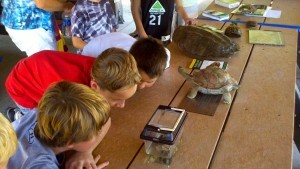 Are you interested in learning more about turtles, including the answers to the questions and topics I raised? You&apos;re in luck! Turtle Time is coming to Sodalis Nature Park in Plainfield, Indiana, on Saturday, July 28, at 11 a.m.! 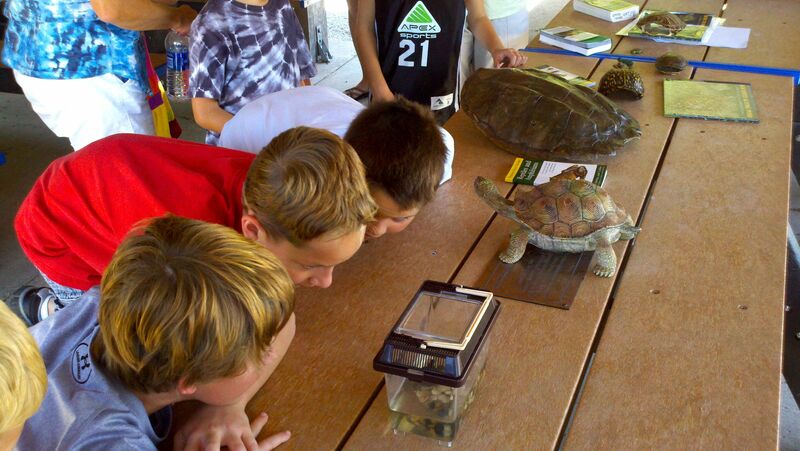 As with the program at McCloud, Turtle Time at Sodalis is free, and kids of all ages are welcome. No pre-registration is required. Hendricks County Parks & Recreation has a lot of other cool summer programs coming up at McCloud and Sodalis, such as fly fishing for beginners, a meteor shower viewing, a river raft build/movie and more. It might be worth it to peruse their summer program guide if you&apos;re seeking fun, free, educational things to do with the kids before and after school starts.